My PC seized up on Tuesday afternoon. That meant that whilst Bob was fixing it, I had to find other tasks. Options- ironing, or preparing more craft materials for Zone [our Sunday Children's Group] Crafts beat ironing every time! I didn't fancy sewing any more finger puppets. I am preparing crafts for 20 children in each storybag. That would require 600 bottle tops and a load of champagne corks. 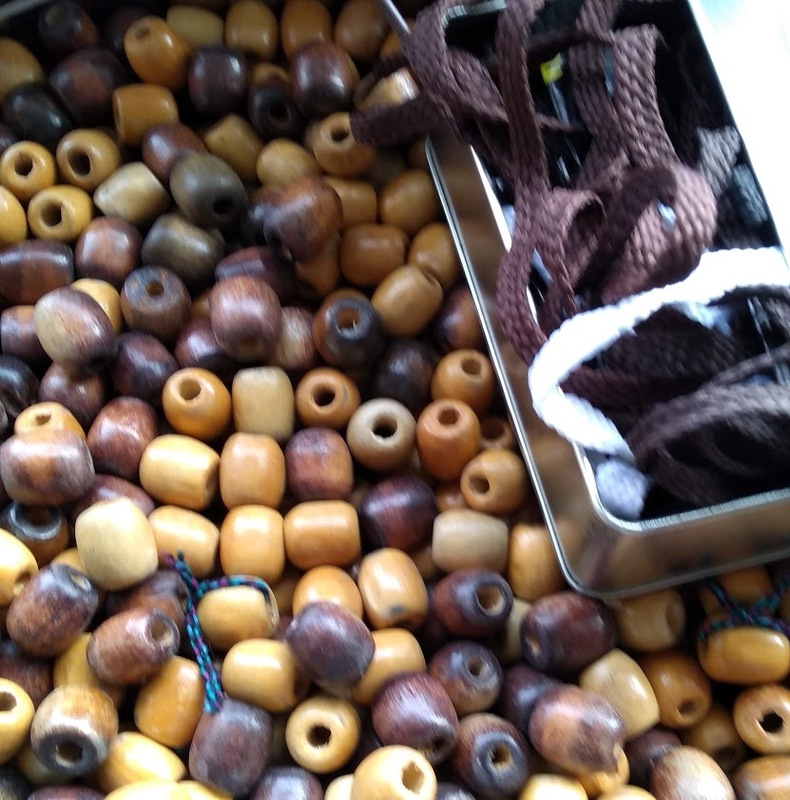 A few years back, a friend gave me a large tin full of wooden 'macrame beads'. I knew I had a jar of assorted coloured beads, and a tin of pound-shop shoelaces. With a large bead as the head, and a small foam bead at the end before the know, I was confident I could make a snake which would be simple enough for the children to copy. 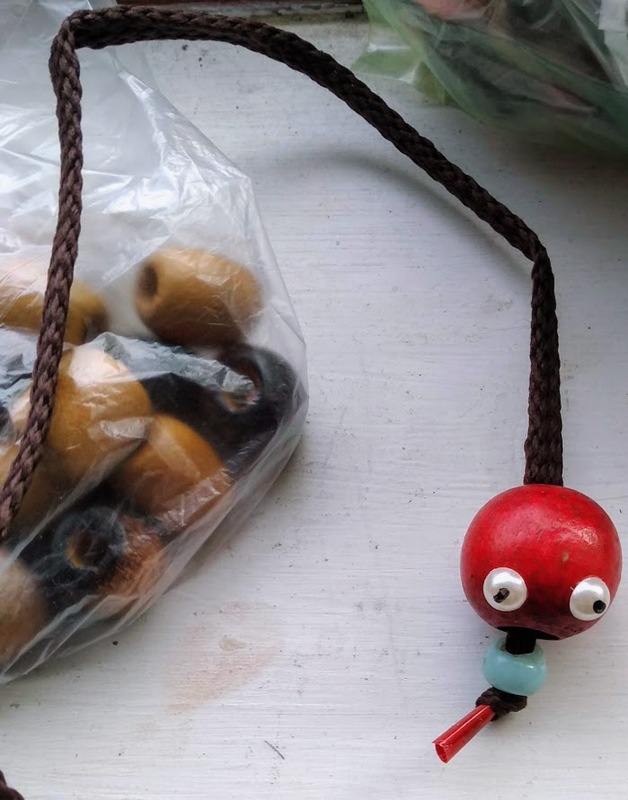 I cut shoelaces in half, stick goggle eyes on large beads, and prepared 20 strings. Then I spent ages counting out the beads into little bags - I had a smaller number of painted beads to vary the colours of the snakes. At last my exemplar was done and the bags were all packed. And Bob had fixed the computer. It's definitely on the way out, but I'm inheriting one from Liz shortly so that will help. 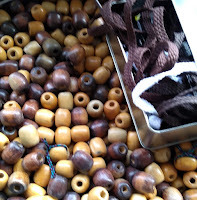 Bob is very pleased- I have just depleted my stash of wooden beads by 30%. 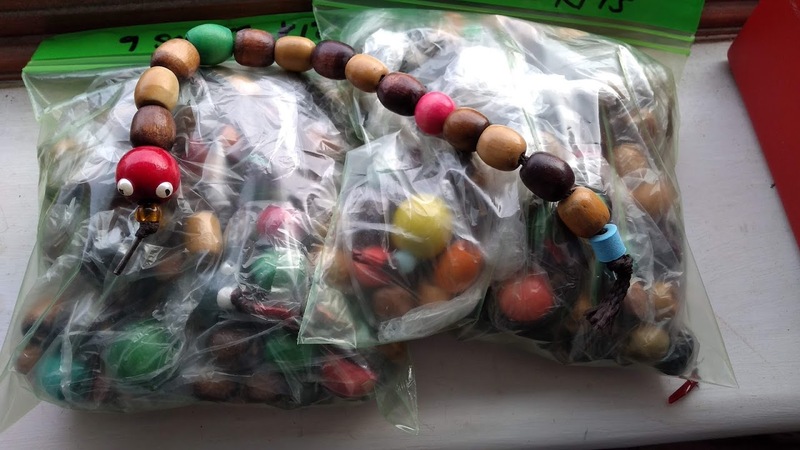 I've used up all my coloured beads, large and regular sized, so only natural wooden coloured beads left. I remember you sending me a bottle top snake kit. In the end, they got turned into Bottle top shakers along with some other lids but I do so like the idea! 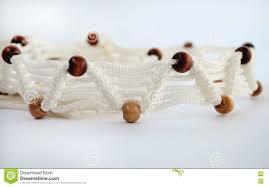 Your bead snakes were a good way to use up the stash-what lucky kids they are at Ferndown! Thanks Kezzie- do you need any beads for school? That is an awesome looking snake! I agree with you - crafts beat ironing anytime! LOL. Glad your PC was fixed! I just finished the ironing pile! Yippee! Thank you Heather - most of my ideas are not original - but are sparked by other people's creativity, I just tweak things a little bit. Angela I would be delighted to have some of the beads for my volunteer craft class. We make crafts with what we can upcycle / are given. We’re a group of older people and it’s great working with the ladies after nearly forty years of 3-12 year olds. Thanks. Thanks for sharing these great craft ideas for Paul's shipwreck story. I teach Sunday School and the kids will love making snakes!